GARY LUCAS' longtime band GODS AND MONSTERS just returned Oct 2015 as the house band performing 6 sold-out shows in Australia as part of "A State of Grace: The Music of Tim and Jeff Buckley"—a multimedia show featuring vocalists Martha Wainwright, Steve Kilbey (The Church) and others celebrating the great music of the Buckleys, father and son. Gary was the Music Director and arranger for this show, and plans are afoot for more international appearances with the project next year. 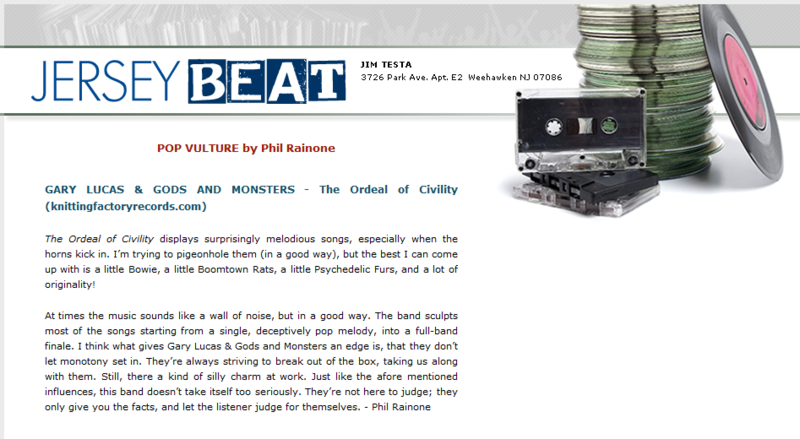 5 Star Review of "The Ordeal of Civility" from Music News.com (UK)!! Video for "SWAMP T'ING" by Jill A. Black up now!! Check out a video for "LADY OF SHALOTT" directed by Caroline Conejero! A vinyl version of Gary Lucas & Gods and Monsters' album "The Ordeal of Civility" was released on 5nakefork Records (5F-058), distributed by Sony/Red! "The Ordeal of Civility" receives 4 STARS in MOJO!! Rave reviews for "The Ordeal of Civility" also just in from the Valley Advocate, AcousticMusic.com, Rocktober Reviews, Jersey Beat, The Big Takeover, Dusted Magazine, Crawdaddy, CultureCatch.com, the Gapplegate Guitar and Bass Blog, The Reviler, and two reviews in Nanobotrock here and here! Check out Gods and Monsters blazing version of Abdullah Ibrahim's "Bra Joe from Kilimanharo" live at CMJ. Check out the Gods and Monsters music video for "LuvzOldSweetSong" up on YouTube now. See "Fata Morgana" in HD from the Gods and Monsters 20th Anniversary Show in June 2010. "THE THINKING MAN'S GUITAR HERO...AN UNDERGROUND ROCK FAN'S DREAM TEAM"
"YOUR BAND IS REALLY AMAZING!" 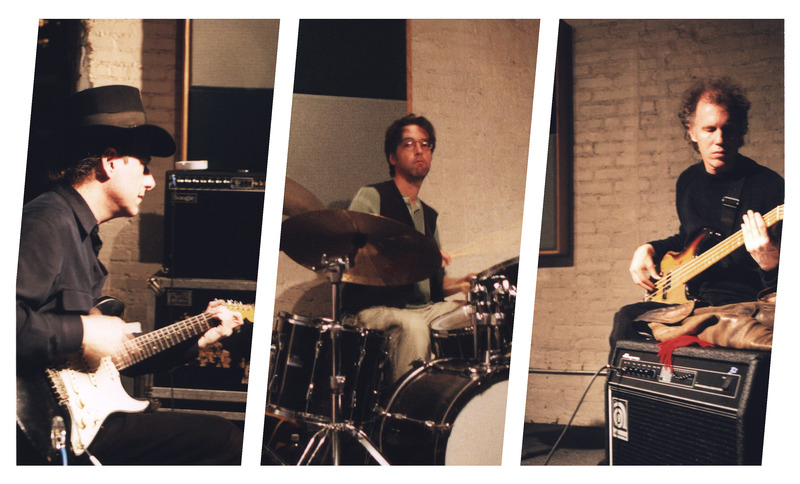 Gods and Monsters is an avant-rock supergroup / jamband playing intense psychedelic rock. 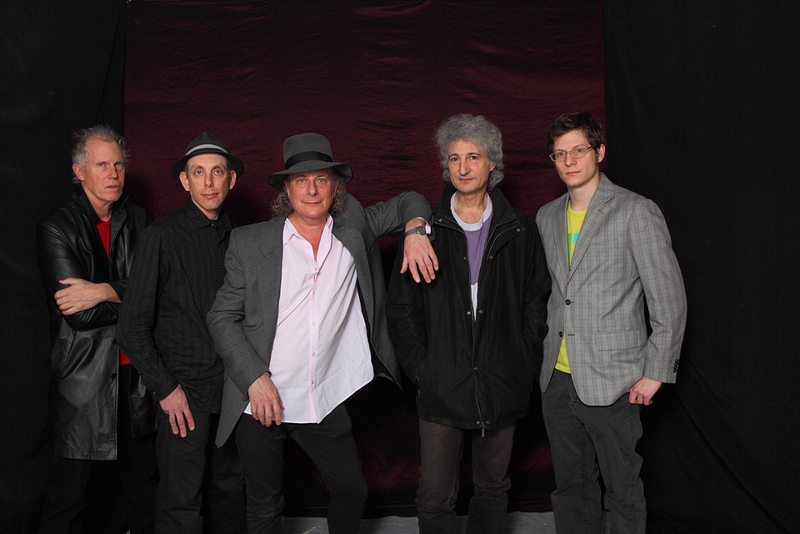 Featuring guitarist extraordinaire and Grammy-nominated songwriter Gary Lucas (Captain Beefheart, Jeff Buckley) on guitars and vocals; Billy Ficca (Television) on drums; Ernie Brooks (Modern Lovers) on bass and vocals; Jason Candler (Hungry March Band) on alto sax; and Joe Hendel (Latest Show on Earth), trombone and keyboards. Jerry Harrison (Talking Heads) occasionally joins the group live on stage and in the studio on keyboards, and has performed with the band in Russia, Holland, NYC, Oberlin College, and at SXSW in Austin Texas. A hit producer (Live, OAR), Jerry Harrison has just finished producing Gods and Monsters new studio album, "The Ordeal of Civility". Check out a clip of "Swamp T'ing" here — a track from the forthcoming Gods and Monsters live DVD/CD. 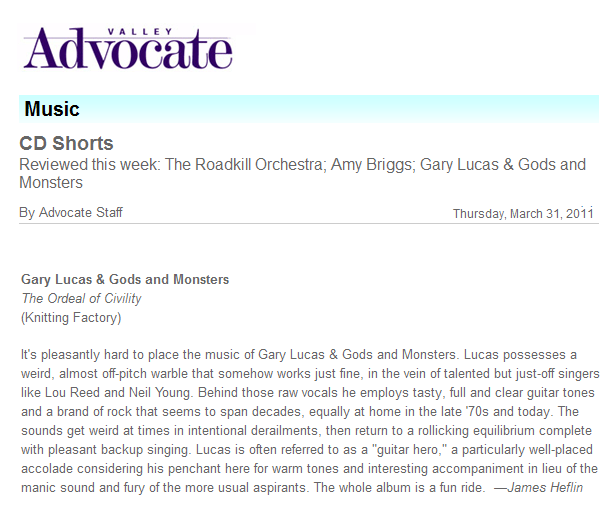 Check out a rave review from Variety of Gods and Monsters live here — and reviews of the band live at SXSW 2007 here. Gary Lucas & Gods and Monsters album "Coming Clean" was unleashed on Mighty Quinn Records in the US, Canada and Japan; on Side Salad/Universal in the UK; in France through Productions Speciales; in the Benelux through DAWA Records; in Russia on Exotica Music; and in Germany and Scandinavia. 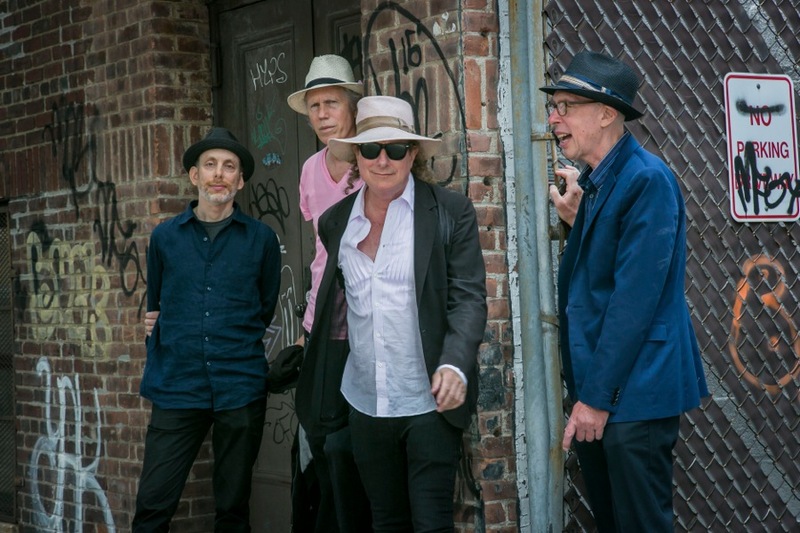 "GARY LUCAS IS ONE OF THE BEST AND MOST ORIGINAL GUITARISTS IN AMERICA—A MASTER SYNTHESIST OF DEEP BLUES, AVANT-ROCK AND MADRIGAL-LIKE FOLK WHO WAS A VITAL MEMBER OF CAPTAIN BEEFHEART'S LATE-PERIOD MAGIC BAND AND AN EARLY MUSICAL PARTNER OF THE LATE JEFF BUCKLEY. LUCAS IS ALSO A SONGWRITER OF ESTABLISHED INVENTION—HE CO-WROTE BUCKLEY'S SIGNATURE SONGS 'GRACE' AND 'MOJO PIN'—AND HIS LATEST ALBUM 'COMING CLEAN' MADE WITH HIS BAND GODS AND MONSTERS IS AN ACTION-PACKED INTEGRATION OF HIS GIFTS. HE PLAYS ASTOUNDING GUITAR THROUGHOUT, BUT ALWAYS FOR THE SAKE OF THE SONG." 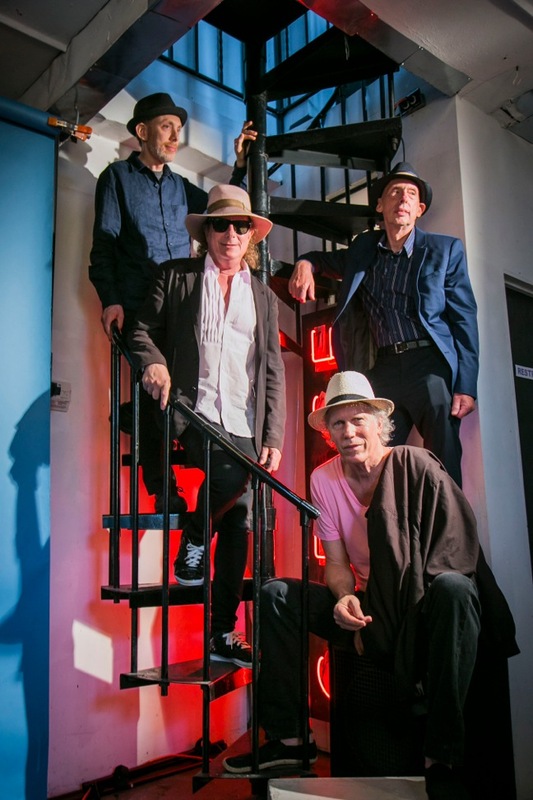 "4 STARS—LUCAS' SONGS CARRY HIS CHARACTERISTIC WARMTH AND WIT...AND THE BAND—WHICH FEATURES BILLY FICCA FROM TELEVISION ON DRUMS, EX-MODERN LOVER ERNIE BROOKS' BASS, AND ONE-TIME TALKING HEAD JERRY HARRISON ON PRODUCTION DUTIES—ARE A FORMIDABLE UNIT. HIS GUITAR PLAYING IS SUPERB THROUGHOUT—WHEN HE LETS FLY IT'S BREATHTAKING." "4 STARS—HIS PLAYING CAN BARELY BE CONTAINED, SPEEDING AND BURNING WITH INTENSITY AT ALL TIMES." 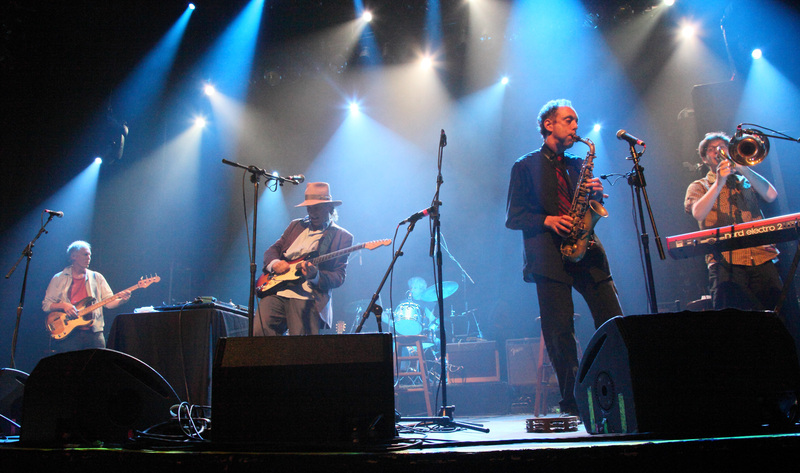 "4 STARS—RISK-TAKING HAS LONG BEEN A FULL TIME JOB FOR GARY LUCAS. GODS AND MONSTERS ARE A SUPERGROUP FROM THE NEW YORK UNDERGROUND IN MUCH MORE THAN NAME. 'COMING CLEAN' TREATS ALL WHO VENTURE ITS WAY TO AN UNSETTLING RIDE THROUGH A LANDSCAPE OF EXPRESSIONISTIC BLUES CREATIONS, ART-ROCK, AND BURSTS OF RAMPANT PSYCHEDELIA. REVELATORY IS THE WORD." 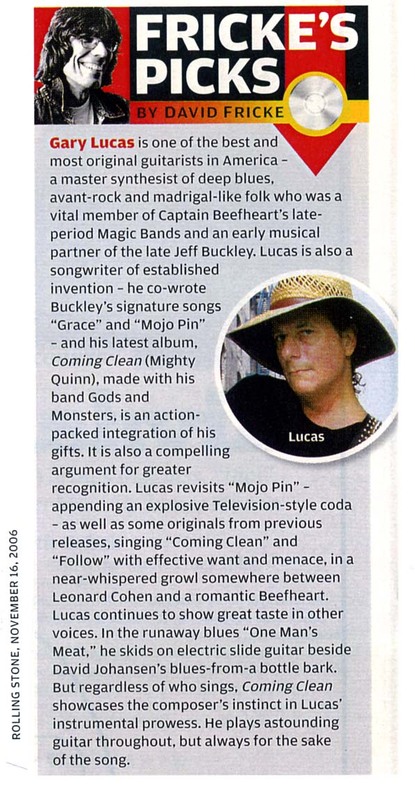 Gods and Monsters has been Lucas' baby since 1989, and has featured such luminaries as Jeff Buckley and Matthew Sweet. 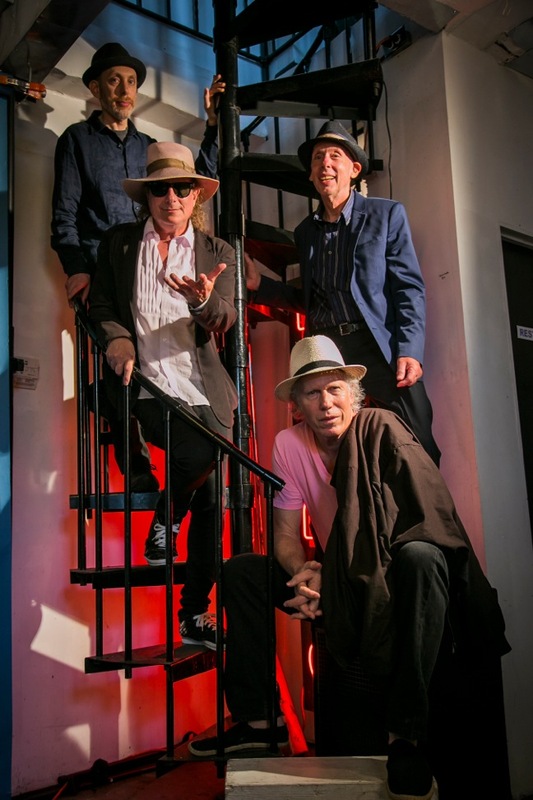 In Gods and Monsters, Lucas' exceptional songwriting talents get a thorough workout, and with the help of Ernie, Billy, Jerry, Jason and Joe, Gary Lucas & Gods and Monsters becomes an all-out jam, blowing the roof off of virtually every show they play. 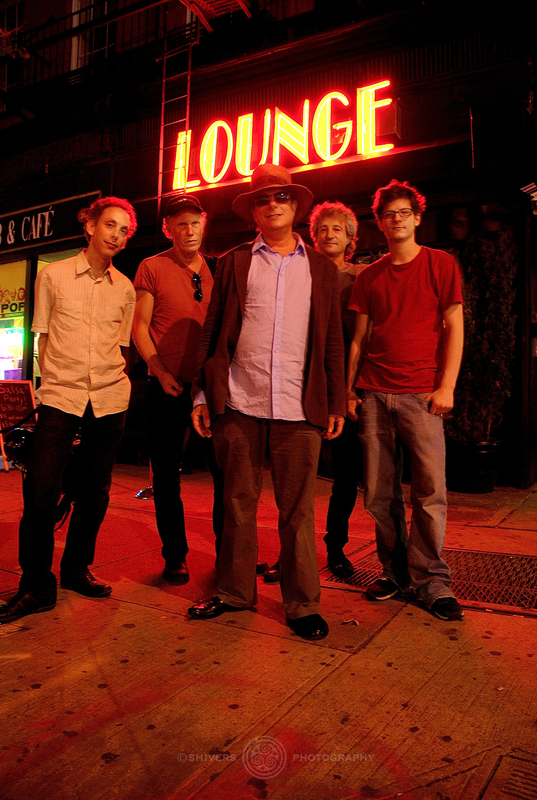 Gary Lucas put the first version of Gods and Monsters together in 1989 as an all-instrumental aggregation, who made their debut at the Welcome Back to Brooklyn Festival in Prospect Park. Envisioning a loose collective of instrumental (and later vocal) provocateurs along the lines of groups like Material and The Golden Palominos, Lucas dubbed his band of merry pranksters Gods and Monsters from a line of dialogue in the 1932 horror film classic "The Bride of Frankenstein" (mad scientist Ernest Thesiger toasts the equally mad Dr. Frankenstein (Colin Clive): "To a new world of GODS AND MONSTERS!" — a line of dialogue that Gary sampled and played during these early shows). The group then featured two bassists, Paul Now and Jared Nickerson, and drum ace Tony "Thunder" Smith (Jeff Beck, Lou Reed, Nina Hagen). Realizing that despite the positive response he received he would need to develop his songwriting in order to expand his audience beyond the rock / jazz / experimental / instrumental crowd, Lucas began writing his own twisted brand of art-pop songs and bringing in male and female singers (and even a rapper and scratcher!) to augment his live shows. The results can be heard on two albums he recorded for Enemy Records, 1992's Gods and Monsters ("4 stars," Rolling Stone) and 1994's Bad Boys of the Arctic ("Lucas reinvents Led Zeppelin III," Guitar Player), reissued as the compilations Operators are Standing By (Knitting Factory) and Level the Playing Field (Last Call). Among the talented members who have passed through the ranks of Gods and Monsters are singers Rolo McGinty (Woodentops), Matthew Sweet, drummer Keith LeBlanc, Sonya Cohen, Mary Margaret O'Hara, Dina Emerson, Richard Barone (The Bongos), Jeff Buckley, and longtime drummer Jonathan Kane. 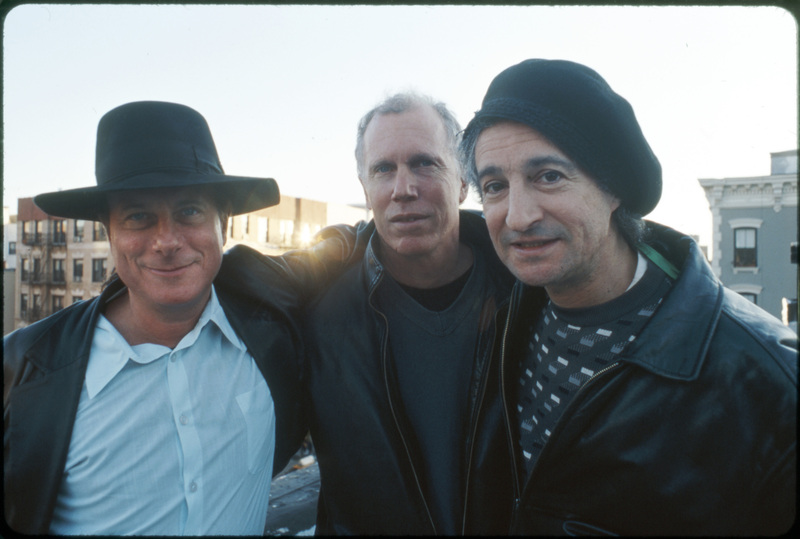 The title song of Jeff Buckley's album "Grace" and the first track "Mojo Pin" were both co-written by Gary Lucas who also played on both tracks. Both were originally in the Gods and Monsters songbook of 1991-92. "Grace" was recently named the #1 Modern Classic Album in MOJO magazine over albums by U2, Radiohead, and others.